Families and groups of all sizes who want to be in the heart of everything love calling the Holiday Inn Oceanfront their home away from home. This coveted property enjoys a prime location along the busting Myrtle Beach Boardwalk, which provides easy access to a plethora of area attractions, entertainment, and restaurants. See why the Holiday Inn Oceanfront could be the perfect resort for your next Myrtle Beach getaway! Immerse yourself in the sights and sounds of the beach at this boardwalk property! Literally steps from your hotel room, the Myrtle Beach Boardwalk extends just over a mile in length and gives guests direct access to all of the fun that downtown Myrtle Beach has to offer! The main boardwalk area is just a short walk south and is a popular spot for live entertainment and family friendly activities throughout the year like the annual St. Patrick’s Day Festival and the Hot Summer Nights events. 2016 promises to be an especially exciting year for the boardwalk as it hosts the second annual Carolina Country Music Festival – a three day event coming to the beach this spring! Other boardwalk finds include popular restaurants like Pier House and Banditos, arcades, and local shops where you can find everything from jewelry and souvenirs to apparel, handmade art, and more! Whether you are looking for a small efficiency or a spacious suite – the Holiday Inn Oceanfront offers eight unique room types to make finding your perfect beach retreat easy. Room types vary from efficiencies that can accommodate up to three guests to oceanfront suites that can accommodate up to seven guests, ensuring plenty of options. Other considerations include whether you want an oceanfront room or an ocean view room and whether you’d prefer a full or efficiency kitchen. Each room is fully furnished with all of the comforts of home including linens, pillows, and any kitchen materials you could need (for units with full kitchens) – plates, dishware, plate ware, and utensils. Additionally, each unit offers a private balcony with great views of the Atlantic, perfect for an early morning sunrise or a dinner al fresco. With all of these great options, you are sure to find the perfect option for your family! 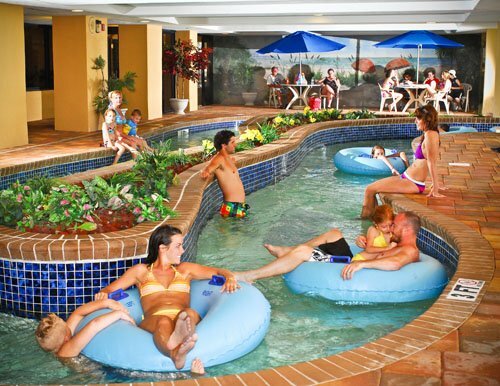 Guests of any age are sure to love the on-site amenities offered at Holiday Inn Oceanfront! The five unique pool amenities give you plenty of places to beat the heat and include a children’s activity pool, oceanfront outdoor pool, and indoor pool facility with an indoor lazy river, lap pool, and whirlpool. Guests can also beat the heat by taking just a few extra steps to the pristine beach. The oceanfront location of this resort makes beach access a breeze! Gone are the days of packing up the car, fighting for parking, and getting sand everywhere; instead, stay at the Holiday Inn Oceanfront and leave those worries behind. Holiday Inn Oceanfront also offers two dining options for guests – the Tropical Paradise Beach Bar, open seasonally, and a FREE daily continental breakfast offered to all guests! The oceanfront beach bar offers all of your beach favorites including appetizers, burgers, baskets, and any drink concoction you can imagine while the free breakfast varies daily but is always stocked full of traditional breakfast favorites. Not only do these amenities make it easy to enjoy fun in the fun without having to leave the resort, they also provide more “bang for your buck” and give guests the ultimate vacation value. In an effort to make family beach vacations more affordable than ever, the Holiday Inn Oceanfront offers several seasonal hotel deals throughout the year. Specials range from free night deals (buy 3, get 1 free) or percentage off discounts that help you save big. Other discounts include special rates for military families and early booking deals that give guests huge discounts for booking in advance. 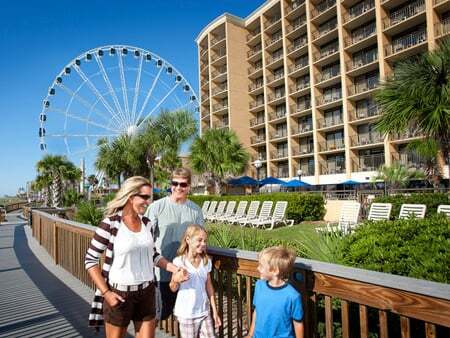 Additionally, Holiday Inn is part of the Free Stay program offered through MyrtleBeach-Resorts.com. Membership to this program is free and is activated after your first stay. Guests will accumulate points each night during their stay that can be redeemed for free stays in the future! It’s not hard to see why guests flock to the Oceanfront Holiday Inn Resort year after year. Be sure to check out current hotel deals and book your stay today! Happy New Year! So much has taken place in Myrtle Beach over the past year and now that 2017 has begun, we finally get to see all the new and wonderful changes that have been happening. If you are curious about all of the new and exciting things that Myrtle Beach has in store, check out our annual recap of what you can expect! Broadway has recently signed new agreements with several exciting new restaurants and shops. Take a look at some of the most recent additions that now officially open for business! Wahlburgers: A fast casual burger concept by Alma Nove founders, Executive Chef Paul Wahlberg and brothers Mark & Donnie Wahlberg. American Tap House: A chef-driven American Gastropub united by craft beers and craft food. Dedicated to the “art of fine food and beer. Extreme Pizza: Innovative pizzas made with fresh ingredients and mouthwatering crust. Beef Jerky Store: The very best selection of premium jerky. New Location For The Hard Rock Cafe: Out with the old and in with the new! The ever popular Hard Rock Cafe has moved from their iconic pyramid building into a sleek new spot on the bustling corner at Celebrity Square. Carolina Ale House: A new sports bar franchise is opening up at the former Planet Hollywood location next to Legends in Concert. Carolina Ale house already has several locations throughout the state and is a popular spot for families and sports enthusiasts! Dave & Busters: The highly anticipated Dave & Busters is finally under construction at the former Hard Rock Cafe location. This wildly popular restaurant, bar, arcade combination is sure to be a huge hit with both families and groups looking for great food and entertainment at Broadway! Paula Deen Restaurant: A brand new Paula Deen restaurant concept is in the works for Broadway at the Beach at the old Carlos’ n’ Charlies’s location. The two story, 21,000 square foot restaurant and retail space is in the approval stage now and construction should begin soon! The recent renovations and additions are sure to be a big hit with guests this summer! Even if you have been to Broadway at the Beach before, be sure to stop by this bustling outdoor center to enjoy all of the new additions. Broadway at the Beach is not the only spot in the Myrtle Beach area to be receiving some awesome new additions! There have been several new restaurants popping up all over the Grand Strand and stirring up some excitement to the community. Amazing Z’s in North Myrtle Beach: Bright counter-serve operation offering sandwiches, soups & salads, along with craft beers & wines. Claw House located in Murrells Inlet: Casual, upbeat lobster house & raw bar with some non-seafood options, a large deck & water views. El Cerro – Opening this Spring across from Broadway at the Beach: The departure of Carlos’ n’ Charlie’s at Broadway left a void for fresh south of the border cuisine. Thankfully, El Cerro is renovating the former Mykonos building and will be opening their new location this Spring. With the highly anticipated Panera Bread finally open for business and the construction of RIPTYDZ Oceanfront Grille & Rooftop Bar soon coming, there is no doubt that the Grand Strand is booming with several new and adventurous restaurants. Along with all of these new restaurants, there are rumors of a second Wicked Tuna restaurant opening up on Ocean Boulevard near the Myrtle Beach Boardwalk – stay tuned for updates! Pirate Ship Adventures in Murrells Inlet: This recent addition to the Murrells Inlet MarshWalk has been a huge hit with families! The new interactive pirate ship is a true adventure where children come to experience the magic of sailing away in search of sunken treasure. The Track Recreation Center: This new family recreation center is a one-stop action-packed fun for the whole family. The Track features two multi-level elevated go-kart tracks, a rookie track, a kiddie track, and an expansive indoor family arcade. Children’s Museum & Library: The downtown Myrtle Beach area has plans for a brand new area for children. The new museum and library will combine the existing Chapin Library and the Children’s Museum of South Carolina into the innovative new space. East Coast BrewBoat: The Murrells Inlet MarshWalk is getting an exciting new attractions this spring! The East Coast BrewBoat is an 8-person, foot powered paddle boat experience where guests are invited to bring their own beverages and snacks for a one of a kind inlet experience. Some other exciting additions to the Myrtle Beach area are the new owners for the Cooper House Dinner Theatre and Library, and rumors of Aldi Grocery Stores to be opening up in North Myrtle and Myrtle Beach this upcoming Spring. Stay tuned for any and all updates on the Grand Strand's newest and most exciting restaurants, attractions, and construction in the area!